Wow!! Look what we painted this year. Thanks everyone for helping to make another SUCCESSFUL year. Now it is time to celebrate the what we have accomplished and to plan another wonderful year. Come join us at Marie's house for a terrific "Get Together" and help us select fun projects for next year. We need everyone's input to make it happen each year. So come with suggestions and ideas for next year. December 10 @ 11:00 AM, Marie George Loucks - 104 Coronada St, Enterprise. If you haven't already let her know you are coming, please contact her at melartist@msn.com or 334-347-7488. Marie sets a beautiful table with a place for everyone so she NEEDS an actual count. We home to see you there. COME PLAN & DINE WITH US!!!!! ​Kimberli Fougeron - Colored Pencils - "A Little More Advanced Techniques in Colored Pencils"
The paper will be provided. Just bring your colored pencils, what ever you have and come have fun. Judith Reeder - Acrylics - A Little Koi by Sharon Chinn from her pattern packet. Marie Loucks - Oils - Study in Oil Painting designed & taught by Marie Loucks, CDA. Pallet & Prepared Surface will be provided for a fee of $20.00. Everything is provided including a prepped surface & palette. Just bring your own brushes. YOU MUST CONTACT HER IMMEDIATELY IF YOU PLAN TO PARTICIPATE SO SHE HAS A SURFACE PREPARED FOR YOU!!!!! This will be a terrific project so be sure to put it on your calendar and contact Marie. Paint your surface with red paint, or color you want to show through. When dry, using wax or paraffin, scribble here and there across the board. Paint your board with your chalk paint, covering well. When dry, sand the board; and the paint will come off the waxed areas. Paint your letters with Black. 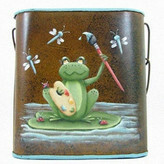 With thin Black Green paint, go over the graphite lines on your frog. Wash glasses with soap and water. Burlap surface of your choice, i.e fabric, placemat, runner, burlap canvas. 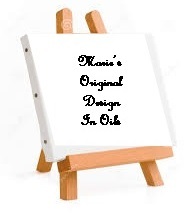 Kim is using a 10" x 20" burlap canvas.